A week, new month, hopefully no more beloved rockstars dropping dead. Really, David Bowie, Paul Kantner, Glenn Frey, Lemmy Kilmister, enough already. Speaking of enough already, let us move on to today's subject of the link between cities and and innovation. 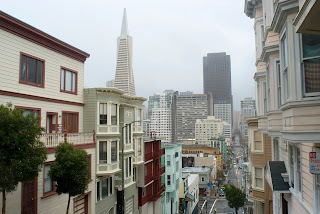 Historically, cities have been rich mixture of people and economic activity. This potent mixture has produced a wealth of innovation. Density is the catalyst for innovation-putting people and ideas together, combining and recombining ideas in new and exciting ways. In an article for CityLab, "The Historic Link Between Cities and Innovation," Richard Florida focuses on transportation-in all its forms-as a mechanism for increasing the circulation of ideas. Percent of US Near Rail or Transportation"
To understand the connection between cities, transportation, and innovation, Ms. Perlman's study incorporated a number of unique data sets. She began with detailed information on over 700,000 patents-which stood in for innovations-for all American counties during the study period. While they may be imperfect, Mr. Florida adds as an aside, "Patent are the most accessible written records of innovation activity:...economists and social scientists have long used them to study the dynamics of technological change and innovation." Ms. Perlman compared this to information accessible means of transportation and distance to major ports; and key words used in patent descriptions, which allowed her to analyze the "...effects of local transportation on the speed of innovative activity. 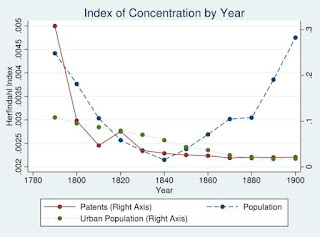 The chart above left demonstrates the connection between innovation, population, and transportation. 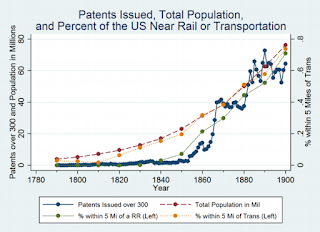 During the timeline, the number of patents and the total population trended upward, overall, perhaps more acutely around the 1850s, coinciding with the increase in access to railroads. 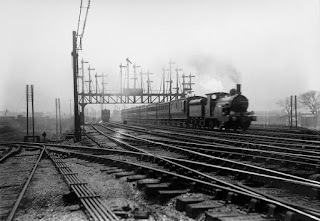 Mr. Florida writes, "Urban historians have long identified the role of new transportation systems like canals and railroads in spurring urban development..." However, Ms. Perlman's paper found the connection between these innovations and innovation. She found that the opening of a canna in a county was positively associated with an increase in patent activity. Further, 20 years after the arrival of a railroad, counties saw the number of patents double per capita. "in fact, the study finds that 8 percent of the increase in 19th century patents was the result of the spread of transportation." The following two maps illustrate the link between innovation and transportation systems by plotting the number of patents per 10,000 people, drawing attention to major railroad lines. Focus your attention on how innovation clusters along major lines. The first map on the left is of the United States in 1840. 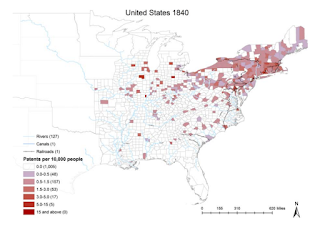 Innovation activity is clustered on the more industrialized New England and Northeastern states, spreading out along rail lines into the Great Lakes region the Midwest, and the more agrarian South. 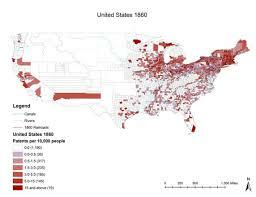 The map on the left is the United States on the cusp of the Civil War. While the same basic trend continues, we see that innovation hotspots are present along canal lines (shown in blue) and railroads (shown in red). Twenty years hence, while patents continued to be concentrated in the same Northeast and New England regions, they expanded farther into the Midwestern and Western states like: California, Arizona, New Mexico and Southern states such as: Florida, Texas, and Louisiana saw upswings in innovation. 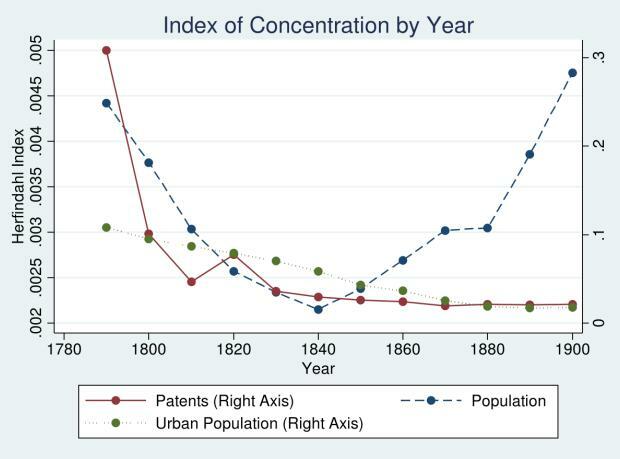 "index of Concentration by Year"
If you look at the chart on the left, "index of Concentration by Year," what we see is a steady decline in geographic concentration of patents during the 19th century. It seems counterintuitive to the concept of innovation clustering. We can conclude that this decline in geographic concentration of patents was the result of transportation, which enabled innovation to move out from its East Coast source and create new clusters in rapidly growing parts of the country. In general. Elisabeth Ruth Perlman found transportation "...to be a key determinant of innovation in rapidly industrializing and urbanizing America." However, the instrument implemented to make this happen is far more fascinating and more important, to understanding innovation. Ms. Perlman's analysis demonstrated that innovation is not just a product of population nor access to larger markets via train, although both are important but not the sole necessities. Rather, it is more subtle. Ms. Perlman explained in an email to Richard Florida. If transportation simply runs through a place, it doesn't do any good unless it also forms a nexus around which agglomeration occur. This is shown in the different effects estimated in the North and South. Elisabeth Ruth Perlman went on to study the link between new forms of transportation and the flow of information. To understand how it worked, Ms. Perlman followed "...the spread of key words and phrases in more than 700,000 patents to determine how quickly a new idea or technology spread into an area, and to what degree new forms of transportation contributed to this expansion." Mr. Florida expressed surprise that Ms. Perlman found "...that transportation doesn't see to be encouraging more references to new technologies." Rather, regions newly connected to transportation incorporated technology more slowly than previously. Because transportation encourages urbanization...it encourages patenting in many ways. Urban areas allow for greater specialization, which might encourage patenting by giving people intros areas better access to the bureaucracy (e.g. lawyer, machinists, craftspeople) or by encouraging innovation directly. Perhaps the most important take away is the way in which urban centers and advances in transportation speed up the movement of goods, people, and in particular ideas. Moreover, these advances are just the result of history. 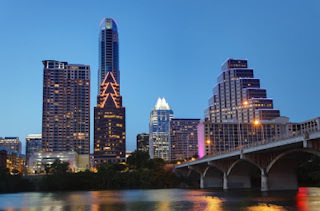 Richard Florida writes, "While the car facilitated the spread of innovation to suburban nerdistans in the 11970s, '80s, and '90s, the past decade or so has seen innovation and high-tech startup companies move back to urban centers near transit line where people and ideas can connect more efficiently." 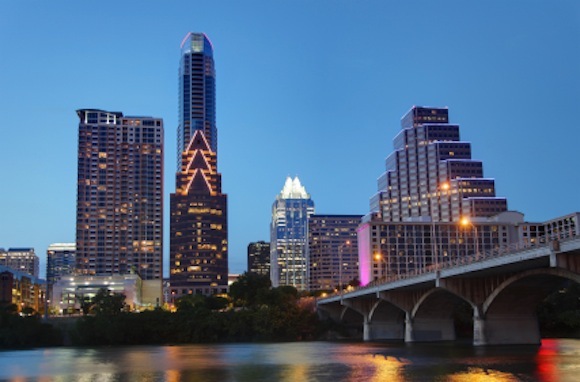 Elisabeth Ruth Perlman's research demonstrates the importance of urban areas, transportation, and connectivity in moving American innovation forward throughout its history.